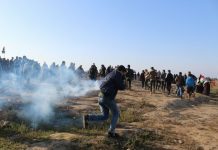 Today, Wednesday, 24 October 2018, in a new crime of excessive use of lethal force against Palestinian civilians, Israeli forces killed a Palestinian civilian and wounded 3 others in Tamoun village, southeast of Tubas. This crime and other killings lately committed by the Israeli forces prove that the Israeli forces deliberately aiming at inflicting the highest number of casualties among Palestinian civilians. PCHR herby condemns this crime, which further proves that the Israeli forces continue to use lethal force against Palestinian civilians aiming at killing them. PCHR emphasizes that the Israeli forces continued targeting of civilians is a flagrant violation of the rules of international law, international humanitarian law, the ICC Rome Statute and Fourth Geneva Convention. PCHR calls upon the international community and UN bodies to stop the Israeli escalating crimes and violations and work on providing international protection for Palestinians in the oPt. PCHR also reiterates its call upon the High Contracting Parties to the 1949 Fourth Geneva Convention to fulfill their obligations under Article 1; i.e., to respect and ensure respect for the Convention in all circumstances and their obligations under Article 146 to prosecute persons alleged to commit grave breaches of the Fourth Geneva Convention. These grave breaches constitute war crimes under Article 147 of the same Convention and Protocol (I) Additional to the Geneva Conventions regarding the guarantee of Palestinian civilians’ right to protection in the oPt.